A very early and rare ca. 1940 Parker “51” deskpen is raspberry red with clear demonstrator taper and aluminum speedline filler. This color never went into production, but a handful of pens have been found in the pocket version. A pair of ca. 1941 deskpens. These pens were available in either Midnight Black or Cordovan only. They had the sharp-ended tapers and speedline metal fillers. Unique to these pens was the “blue diamond” on the barrels and the imprints on the taper. I have never seen a date code on any of them. Some pens are found with no imprints at all on the tapers. 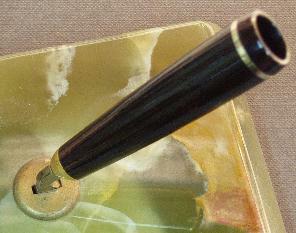 The 1942 production pens also had the sharp taper with an imprint, but with a plastic filler. Some early 1941 deskpens were made as desktop demostrators with a chain attached by a ring as shown here. An interesting variation in the very early deskepens, shown here and below, is the placement of the Blue Diamond much closer to the filler. The placement of the Blue Diamond closer to the filler would had made it almost at the exact center of the pen tip to tip. Why the change? Maybe when the pen was converted into a pocket version, the placement so far near the end of the barrel made it look odd. All four models of Parker “51” vacumatic filler deskpens available. The switch from the sharp ended taper to the rounded taper took place sometime in late 1945. The later Parker “51” vacumatic filled deskpens were available with the regular plastic filler or “black band”, or the button pushed “red band” filler. The barrels on these pens are longer and the tapers are shorter with a breather hole on the side, but overall the pens were the exact same length. The “red bands” were available for a short time, from 1946 to early 1947. 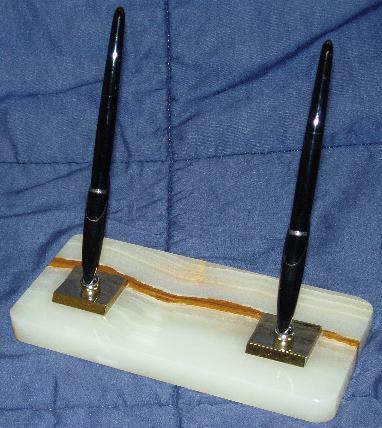 Two versions of the Aerometric filled Parker “51” deskpens. The top pen dates from around 1948 to 1951. The bottom pen has a longer and thinner taper and dates from the mid fifties. Almost all deskpens for the aerometrics are black, but I have only seen one in teal blue with a matching teal blue holder. Some versions had a gold or silver tip at the end of the taper. The silver tip is almost always for the Parker “51” Special. A newly discovered Parker “51” desk pencil with date code of 1953. The taper matches the pens of the era. The pencil was found by itself, but I assume that there is a cup to match it, which must be narrower to fit the pencil. 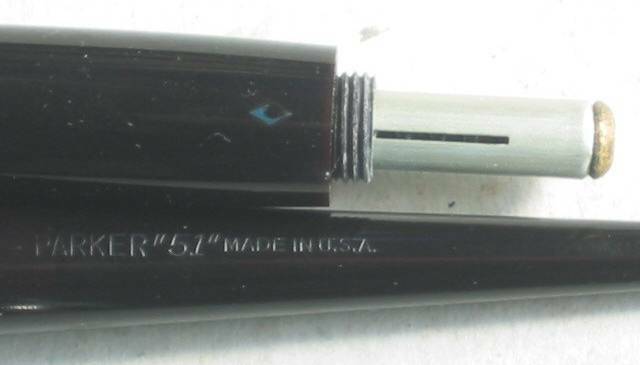 A Parker “51” aerometric deskpen in Teal Blue. “51” aerometric deskpens were only marketed in black. This is one of a few examples found in Teal Blue. A matching Teal Blue holder was also made. 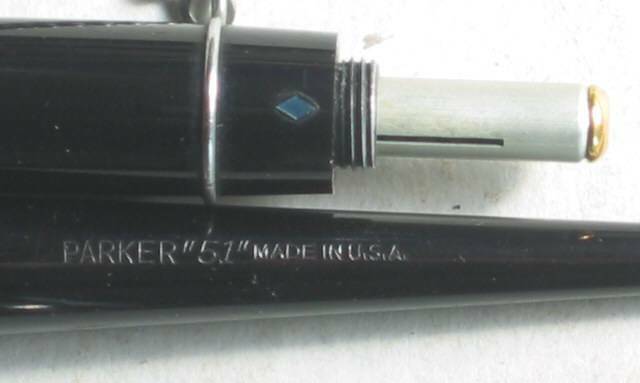 The Parker “51” continued into production into the early 1970’s. The above examples are from the late 1960’s-early 1970’s when the clutch ring was changed to be similar to the Parker “61”. Shown here are from the top, a mechanical pencil (only style I have seen), a ballpoint (only style I have seen), and a fountain pen. Parker “51” Deskbases were made in an amazing variety of sizes, materials and configurations. Below is a small sampling of some examples. The pricing of deskbases can be difficult, as they are clumsy to carry and take a lot of space. Some can be found at very reasonable prices, sometimes less that the price of a corresponding pen or pens. Some of the more elaborate bases with figurines and some of the earlier bases can command very high prices. To the left is standard first year holder with metal swivel mechanism. To the right is detail of first year holder with wartime plastic ball mechanism. 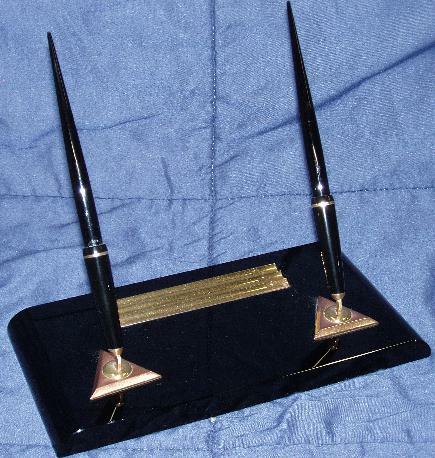 A Parker “51” First Year Deskbase with a pair of Midnight Black pens, blue diamonds on the barrels and sharp tapers, with matching black holders. Black glass base with two holders with triangular attachments. Note that the triangular shapes are pink in color (copper? ), while the holder themselves are yellow (brass?). 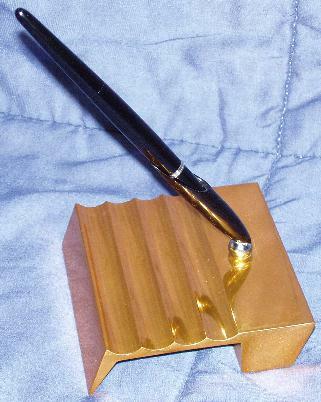 Rest for the pens is also yellow brass. Parker “51” First Year Deskbase with a pair of Midnight Black pens, blue diamonds on the barrels and sharp tapers, with matching black holders. Black marble with cream veins with chrome decorations. Clock is electric “Telechron”, which is working and keeps perfect time. This was one of the more expensive early bases according to catalogs. To the left, a Parker “51” First Year Deskbase with a single Cordovan Brown pen, blue diamond on the barrel and sharp taper, with matching cordovan holder. Note the unusual round base which is a heavy, silverplated dome, trimmed in brass. To the right, a Parker “51” First Year Deskbase with a single Midnight Black pen, blue diamond on the barrel and sharp taper, with matching black holder. Black marble base with cream veins. A ca. 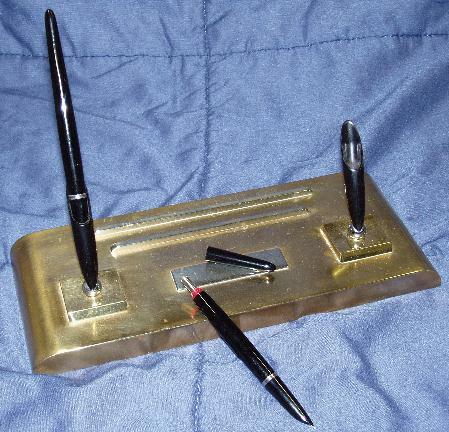 1946 Parker “51” Double Deskbase in brass with a pair of “Red Band” filler deskpens in Midnight Black with matching Magnetix holders. Note the short cups, correct for the time period. “Red Band” pens are most often found in the deskpen version and only in black. The pocket versions can be found in cedar blue and dove gray, in addition to black. To the left, a ca. 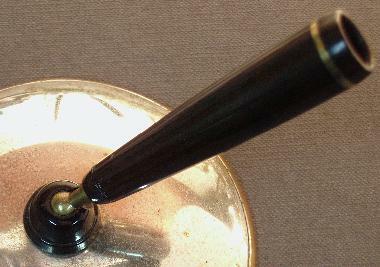 1944 Parker “51” Single Deskbase with a Midnight Black vacumatic filler pen, with matching Magnetix black holder. The base is made of anodized aluminum. To the right, a ca. 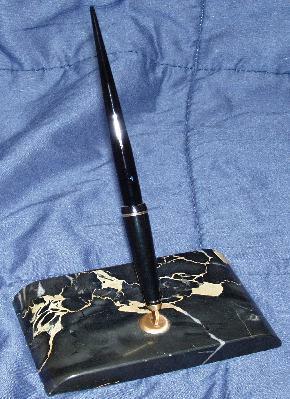 1946 Parker “51” Single Deskbase with a Midnight Black vacumatic filler pen, and matching Magnetix black holder. The base is made of black lucite plastic with a brass plate. Below left is a similar base to the black one, but this one is made of Dove Gray lucite, the excat same color used for the pocket pens. Similar base can also be found in Cordovan Brown. I have yet to see one in Cedar Blue. A ca. 1946 Parker “51” Double Deskbase in pedrara onyx with a pair of Midnight Black vacumatic filler deskpens with matching Magnetix holders. A ca. 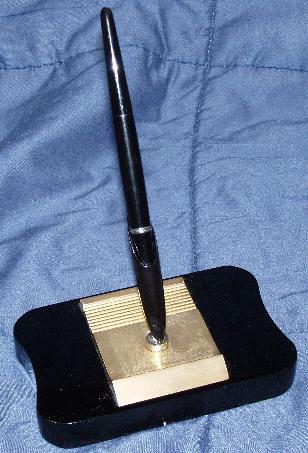 1950 Parker “51” Double Deskbase in anodized black aluminum with brass trim. Rare demonstrator Magnetix holders and half demonstrator Aerometric filler deskpens. I have never seen a completely clear demonstrator deskpen, but there are rumors of its excistance. 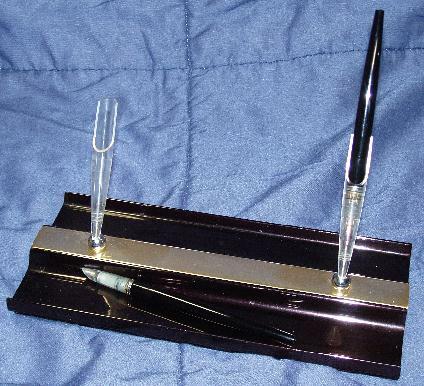 Note the longer style holders used for the Aerometric pens. A ca. 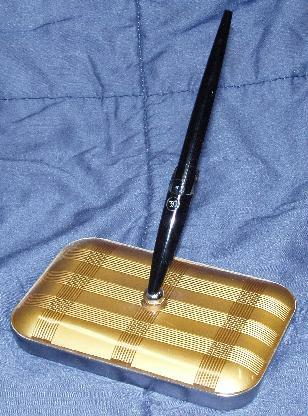 1950 Parker “51” Single Deskbase in gold plaid plastic inlaid over aluminum base with black deskpen and Magnetix holder. A ca. 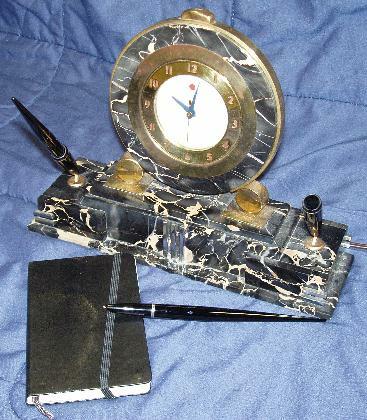 1953 Motorola “VIP” Deskbase in gold color metal with Motorola radio/Telechron clock, perpetual calendar and Parker “51” fountain pen and pencil, with matching Spherix holders.